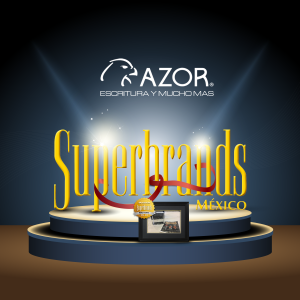 Grupo Azor México has been recognized for 5th consecutive year for “SuperBrands Mexico”, which is given annualy to the most prestigious national brands. In the recent presentation ceremony, the prize was given to the brands which have obtain the prestigious status from the Brands Mexican Committee, integrated for distinguished mexican communication personalities. The selection criteria is composed for 3 key factors: consumers brands recognition of the brand, longevity and clients loyalty. Gaining this badge we reinforze our prestige in the market, knowing that being a Superbrands represents a constant challege for maintain our quality, innovation and passion with what we do our products, always thinking in our costumers. Grupo Azor Mexico S.A.P.I de C.V. All Rights Reserved.